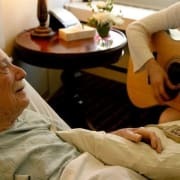 Music Volunteers will provide comfort and support to hospice patients and families through one-on-one music visits. This can be through singing, instrument playing, or simply playing music CDs on a boom box for the patient and their family. Must have reliable transportation, and be willing to visit patients in their homes.